The City of Melbourne (CoM) is progressing with plans to expand and upgrade Lincoln Square over the next five years, with the release of the draft functional layout detailing the extent of the improvement works. This follows the endorsement of the final Lincoln Square Concept Plan by the Future Melbourne Committee in April, based on feedback and support received during community consultation in 2017. CoM is now completing detailed design and anticipates to go out to public tender in late 2018 with construction expected to commence in early 2019. According to CoM, Lincoln Square represents a significant local open space in Carlton, characterised by its mature trees, sunny lawns and gathering spaces. It also lays claim to the hosting Victoria's first public playground, built in 1907. 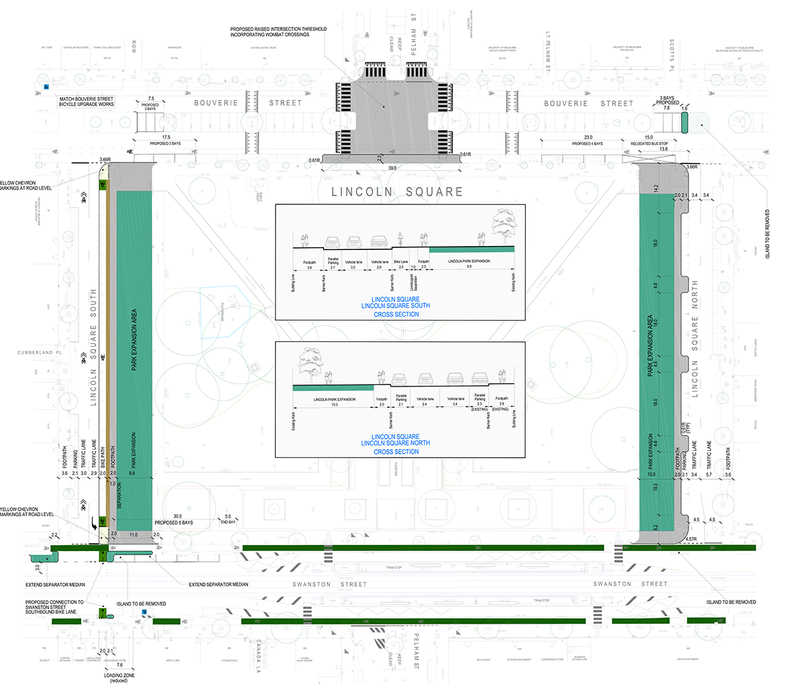 Following works in 2016 to upgrade the plaza on Swanston Street and install an underground stormwater collection and flood mitigation system, CoM has developed a concept plan for the entire park, to ensure that Lincoln Square addresses and responds to the future needs of the local community it serves. Two new radial paths connecting Swanston Street to the plaza to respond to current desire-lines. Change in the design of the eastbound bicycle lane on Lincoln Square South to a two-metre wide physically-separated lane adjacent to the park, including appropriate on-street markings to guide cyclists seeking to turn right into Swanston Street. CoM has observed an increasing demand for open space within Carlton with just under 20% per cent of apartment residents having access to private outdoor space. This is expected to be exacerbated as the local population is expected to surge over the next decade, forecast to grow by as much as 60%. The expansion of public open space at Lincoln Square is critical, says CoM, in responding to the changing needs of the growing local population and building resilience across the municipality. Lincoln Square is used by a significant number of people to get to key destinations such as Melbourne University, with over 900 pedestrians in the morning peak and 700 pedestrians in the evening peak alone. There is currently no pathway along the Lincoln Square North park edge, despite this being a strong desire line for many pedestrians traversing the space. With the growing resident population forecasts and further development of apartment buildings, CoM believes there will be an increase in the number of children in Carlton growing up without access to private open space. The Lincoln Square playground is the home of Melbourne’s first playground and is the only playground in the immediate catchment. According to CoM, the current playground has come to the end of its useful life and needs to be upgraded to address the future needs of a growing population. The playground’s current location within the park is surrounded by 150-year-old Moreton Bay Fig trees and positioned on a grassed hill. The new playground will be designed to celebrate these natural features and to be an inclusive space that connects children, parents and carers through play, and accommodating the needs of children of all abilities and ages. As one of Melbourne's oldest parks, Lincoln Square is home to 150-year-old Moreton Bay Figs and a range of deciduous and native trees. While the majority of trees at Lincoln Square are in good health, CoM notes that there are opportunities for new planting. Lincoln Square caters to a diverse group of people with varying needs and interests including students, families, local residents and workers. It provides a place for respite, lunch gatherings and other activities, however, the park currently has inconsistent furniture, poor lighting and seating that doesn’t always support park use. The new design will address these issues through improved and new seating, in addition to better lighting.